The NEPSE index as at Mid-October 2018 declined by 20.37% to close at 1,241.63 points, compared to 1,559.18 points in the same period last year. 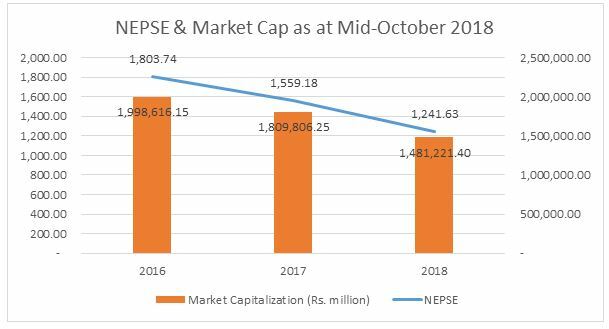 The market capitalization of NEPSE as well declined from NPR 1,809.81 billion in Mid-October 2017 to NPR 1,481.22 billion in Mid-October 2018. Of the total market capitalization, the share of banks, financial institutions and insurance companies stood at 80.9 percent, hydropower 4.3 percent, manufacturing and processing companies 2.7 percent, hotels 1.7 percent, trading 0.1 percent, and others 10.4 percent respectively. 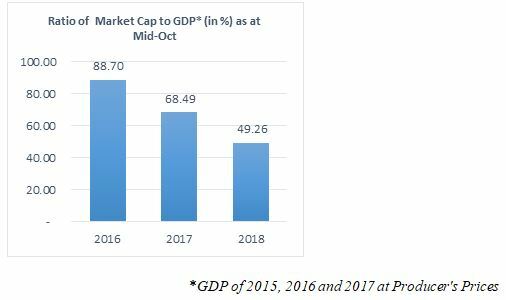 On the other hand, the ratio of market capitalization of NEPSE to GDP as at Mid-October 2018 has significantly dropped down to 49.26% compared to 68.49% in the last year during the same review period. To evaluate current scenario of interest rate in the economy, interbank rate and base rate of commercial banks are taken into consideration. As shown in the chart below, the interbank rate of commercial banks has started to incline to 1.86% in Mid-October 2018 compared to recent low of 1.68% in the previous month in the wake of tight liquidity situation in the banking system. The weighted average interest rate on deposits of Commercial Banks stands at 6.57%, which has consequently increased the base rate of commercial banks to 10.23% in Mid-October 2018, which was 10.03% in the previous month. Last year during the same review period, the base rate of commercial banks stood at 10.08%. The base rate of commercial banks was in increasing trend, and reached one-year-high of 10.47% in Mid-July 2018. 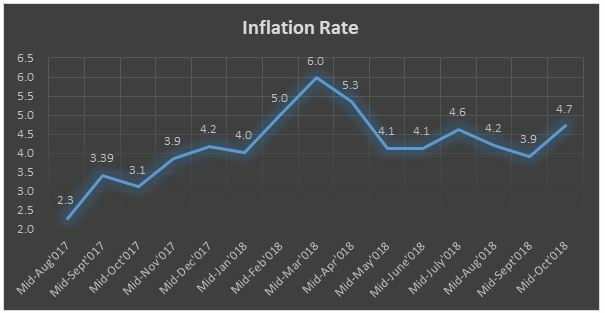 As reported by NRB, the consumer price inflation which was 3.10% a year ago increased to 4.70% in Mid-October 2018, mainly due to increase in price of food, vegetables, meat, fish, alcoholic drinks as well as housing and utilities which contributed to a rise in overall inflation in the review period. However, the ongoing market interest rate on deposits or, government bond and corporate debentures can easily beat this inflation rate. Considering nominal interest rate as weighted average deposit rate of 6.57% (as at Mid-October 2018) and inflation rate of 4.70%, the real interest via Fisher equation is 1.87% only. 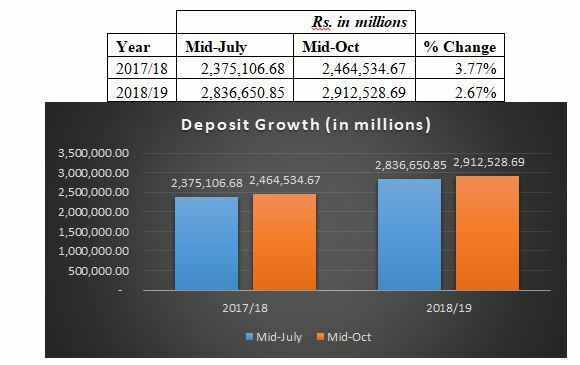 Deposit Growth: The deposits of BFI’s as at Mid-October 2018 increased by 2.67% to NPR 2,912.53 billion, compared to NPR 2,836.65 billion in Mid-July 2018. The growth during the same period last year was 3.77%. The share of demand, saving and fixed deposits in total deposits stood at 8.0 percent, 35 percent and 46.2 percent respectively in Mid-October 2018. Such shares were 8.3 percent, 36.1 percent and 42.50 percent respectively a year ago. And the share of institutional deposits in total deposit of BFIs stood at 43.80 percent in Mid-October 2018. Such share was 45.90 percent a year ago. Credit Growth: The credit disbursement of BFI’s as at Mid-October 2018 increased to NPR 2,597.44 billion by 7.21%, compared to NPR 2,422.78 billion in Mid-July 2018. The growth during the same period during last year was 4.67%. In the review period, private sector credit increased 7.2 percent from commercial banks, 8.0 percent from development banks and 3.8 percent from finance companies. On y-o-y basis, credit to the private sector from BFIs increased 25.5 percent in mid-October 2018. In the review period, term loan extended by BFIs increased 8.8 percent, overdraft increased 4.1 percent, trust receipt (import) loan increased 10.1 percent, demand and working capital loan increased 12.1 percent, real estate loan (including residential personal home loan) increased 4.4 percent and hire purchase loan increased 2.8 percent, while margin nature loan increased 0.6 percent. Though the liquidity situation is at some ease as of now, if we compare the credit growth rate of 3.07% and deposit growth rate of 1.38%, then the liquidity problem is likely to reoccur again if the deposit growth couldn’t matchup with the credit demand and also if there is lag in the government expenditure. In the review period, NRB mopped up NPR 95.35 billion through open market operations. Of which, NPR 79.65 billion was mopped up under deposit collection auction and NPR 15.70 billion through reverse repo auction. On the other hand, NRB injected net liquidity of NPR 80.75 billion through the net purchase of USD 699.1 million from foreign exchange market. Net liquidity of NPR 95.96 billion was injected through the net purchase of USD 930.10 million in the corresponding period of the previous year. The budget surplus of the Government of Nepal (GoN) increased to NPR 32.83 billion in three months of 2018/19 from NPR 11.63 billion in the corresponding period of the previous year. Of the total revenue budget of NPR 945.6 billion, 20.93% has been outturned in the first three months of FY 2018/19. In contrast, only 13% of the total expenditure budget of NPR 1,315.2 billion has been attained in three months of current fiscal year. 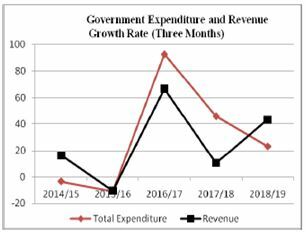 In comparison to three months of FY 2017/18, the government expenditure growth has decreased to 23.13% to reach at NPR 170.95 billion. On the other hand, the government revenue witnessed a growth of 41.69% compared to corresponding period of the last fiscal year. 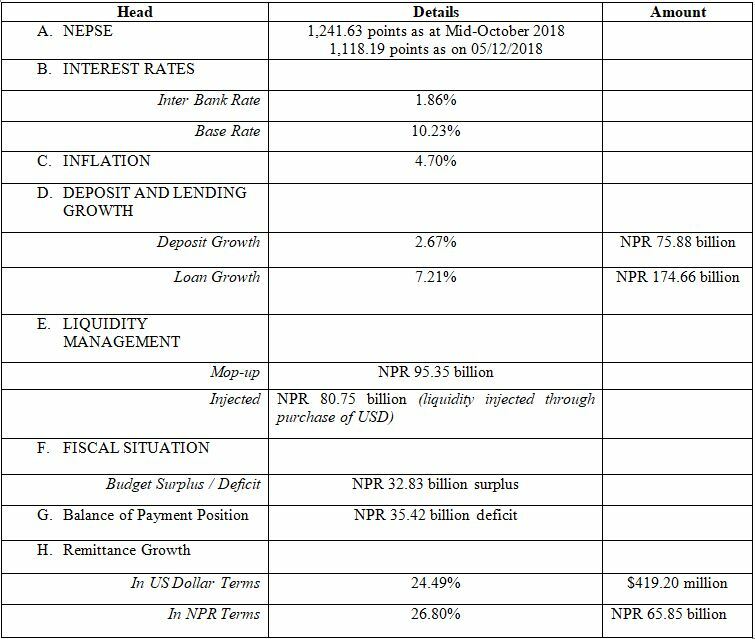 The government revenue for three months in this fiscal year stood at NPR 197.87 billion compared to NPR 139.65 billion in the three months of last fiscal year. The country’s BOP position is already in deficit in the first three months of FY 2018/19 by NPR 35.42 billion, mainly due to huge deficit seen in current account by NPR 81.96 billion as a result of significant increase in imports. During the corresponding period in last year, BOP was at surplus by NPR 4.27 billion only, whereas the current account was at deficit by NPR 25.52 billion. In the review period, Nepal received capital transfer amounting to Rs.3.55 billion and Foreign Direct Investment (FDI) inflows of Rs.1.54 billion. In the same period of the previous year, capital transfer and FDI inflows had amounted to Rs.4.96 billion and Rs.6.07 billion respectively. 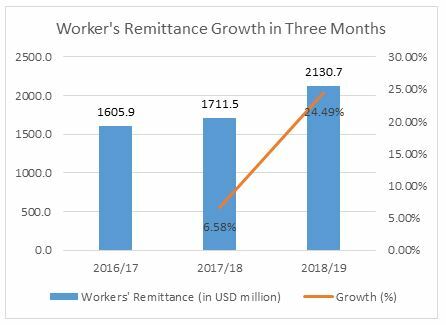 In US Dollar terms, the three months’ data of FY 2018/19 shows that worker’s remittance growth has witnessed an increment of 24.49% to reach $2,130.7 million compared to 6.58% growth in 2017/18. 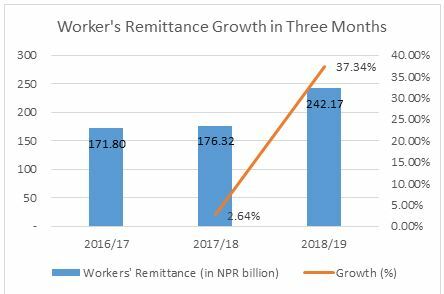 On the other hand, in NPR terms, the workers’ remittance increased by 37.34% to NPR 242.17 billion during three months in FY 2018/19 compared to a growth of 2.64% during the same period in FY 2017/18. As per the data of Department of Foreign Employment, the number of Nepalese workers who migrated for foreign employment decreased 36.7 percent in the review period. It had decreased 2.6 percent in the same period of the previous year. In the review period, the number of workers outbound to Malaysia shrank noticeably.